The lounge at Fyve in Pentagon City. A better-late-than-never deal posting for your Wednesday ... a way to dine at the Ritz on a sports bar budget. 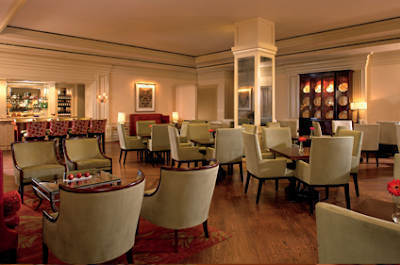 Fyve, the restaurant in the Ritz-Carlton Pentagon City, is offering a menu of $5 appetizers, daily from 2:30-11 p.m. The menu includes dishes like mini sandwiches (grilled cheese with bacon and tomato, short rib sliders, barbecued pulled pork), a plate of local cheeses, parmesan-parsley risotto balls, pizza, grilled chicken wings and desserts including mini cupcakes and cheesecake. A perfectly affordable way to refuel after holiday shopping.